The USB 3.0 4K Mini Docking Station is designed for extra connectivity demands. You can extend the connection of a computer to extra USB peripherals, Ethernet network and the audio output/input through one single USB cable. With the built-in USB 3.0 ports, the docking station enables you to enjoy the super speed data transmission between USB peripherals. Aside from USB 3.0, this product is compliant with USB 2.0/1.1 specification. You will be able to keep and use your USB 2.0/1.1 devices as usual. 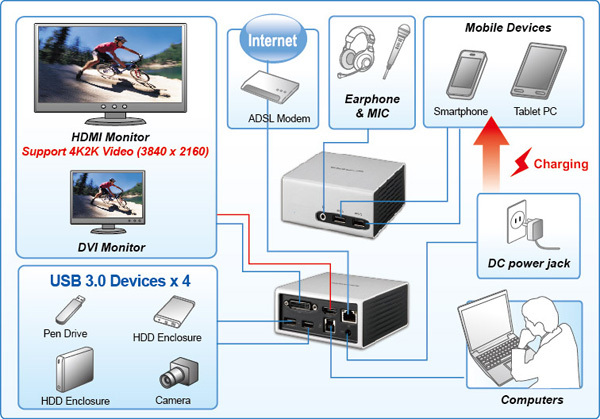 In addition, the docking station is equipped with video output. With the DVI and HDMI ports, you can mirror your primary screen, or extend the Window desktop allowing visibility of more applications at the same time. Enhanced expansion capability plus the stylish appearance, this compact docking station with video is the most versatile accessory that also complements your home or office space. When using the HDMI and the DVI connector simultaneously, the HDMI connector will not be able to reach 4K resolutions. If the device does not work properly with bus power, please connect the external power to the device. * When using the HDMI and the DVI connector simultaneously, the HDMI connector will not be able to reach 4K resolutions. ** It is suggested that you use BC 1.2 charging in self-powered mode.